Sumo (相撲: sumou), I have been familiar with the sport for a while now, because of my interest in Japanese culture, but I never really imagained that I would throw on a mawashi (廻し: a thick waisted loin cloth), be thrown into the dohyou (土俵: the ring made from clay and sand for sumo bouts), and do well! 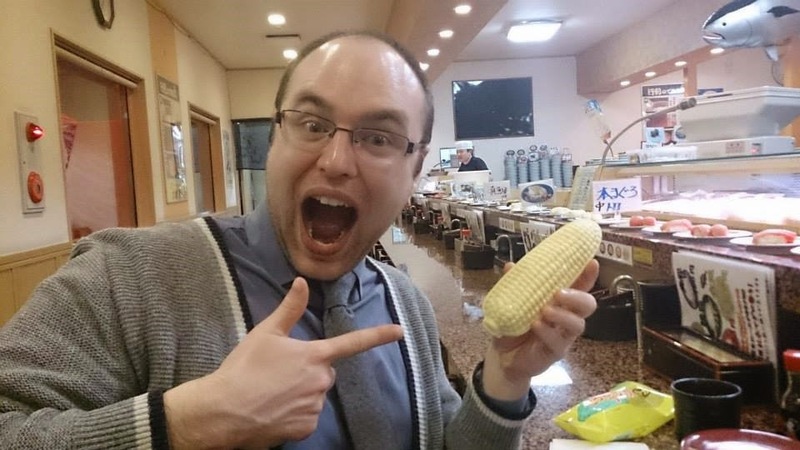 Firstly, I am currently an ALT with the JET Program working for the Board of Education in Katagami City, Akita Prefecture, Japan. I am really greatful to be working with this program due to its amazing network, which has connected me to people from all over Japan. The Akitan JETs are fantastic with all of the events, festivals, professional conferences, and help that is offered. I felt like I was instantly accepted into this community. It was just like when I first went to university or studied abroad, just being thrown into this adventure and instantly bonding with the myriad people going along for the ride. Well, en route on this JET Program ride, one day I got a text message from a friend asking me for help. I just assumed he needed a ride or something, so I sent him a response back asking what was up. He told me that the Sumo competition he was organizing just had a guy drop out and now he had to find a replacement. I had actually known that this was happening, but did not sign up due to the fact that I had never done Sumo, and I was actually still recovering from an injury. But, it seemed like the Japanese gods had spoken and were beckoning me to the arena! I had become a shindeshi (新弟子: a new sumo recruit). Instantly I was being caught up to speed. The tournament was in four days, and I needed to make my shikona (四股名: a wrestler’s fighting name). Memories of watching “Sumo Do, Sumo Don’t” in my university’s Japanese class came back to me, reminding me what I had just signed up for. All the participants went to the sport center early that day. After the women put the mawashi on over their clothes, for the women’s only tournament that day, the men went into the changing rooms to strip down and get their mawashi on, which you can’t do yourself. It generally requires one or two people helping you to get it on, and let me tell you it is not the most comfortable thing to wear. After we had the mawashi on, wrapped our hands and feet in sports tape, and stretched a bit one of the gyouji (行司Sumo referee) taught us the basic Sumo stance, and we each had a pratice bout before starting the tournament. Altogether there were four gyouji at each side of the square dohyou to help make calls during the bout. My first couple of bouts I kind of went blank, because it was really intense! You look into your oppenents eyes as you build your moxie for the tachiai (立ち合いinitial charge at the beginning of the bout). Some bouts were quick, others had participants who could use some Sumo techniques, and then there were a few that were nothing less than a crazy hodgepodge around the dohyou. I learned quickly that it was very important to be able to grab your opponents mawashi in order to get any part of their body, besides their feet, to touch the ground, or to get them out of the ring to win the bout. Somehow, I actually did well and won most of my bouts! I made it to the finals, and at this point it got a bit more complicated. For the participants who made it to the finals we had to perform the shikiri (仕切りthis is the preparation time before the bout where the wrestlers stare one another down, crouch a couple times while moving their arms in and out, drink water, and throw salt). The water that you drink is called chikaramizu (力水 it is considered to be a power water that you drink with a ladle handed to you from one of the other wrestlers). At this point even the big guys were fairly spry and quick on their tachiai. After it was all said and done, and we had new mementos in the form of bruises and cuts to remind us of the good time we just had I managed to take 2nd place! Not too shabby for someone who has never tried Sumo. It really is a thrill unequal to other sports I have played. 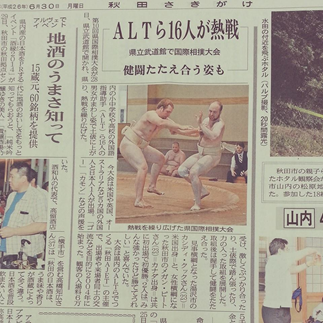 I have a new appreciation and understanding of Sumo due to my participation. It is a yearly tournament, so I may yet again get the chance to dabble in it, test my skills, and see just how much I really did learn. « New Memrise Course – Anime Grammar for Beginners!